Product code: RM-L-Invader-1-100 Categories: Women, ENGLISH, Polo Boots, Invader-1 Polo Boots. Boot will perfectly mold to the foot. One buckle closer provide look & strength. 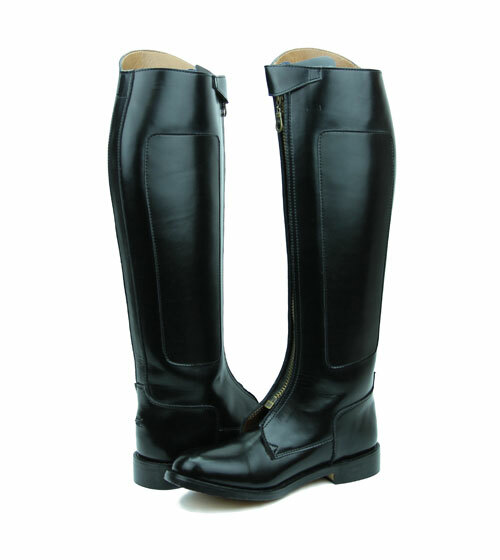 Hispar® Women Invader-1 ankle strap polo boots is a cutting edge Polo boots with the elegance and style. Hand made by master boot makers specifically for the needs of Polo player. We work together with Polo players to design this boot, that’s why it gives players the edge in competition. All the features were designed to the players specifications, and result is a technical superior polo boot. Players around the world love to wear. If you aren't 100% satisfied with your order, you can return it to us for a refund within 30 days of delivery. All returned items must be in their original packaging with the tags attached and be in new, unworn, and unwashed condition. We offer an online return process where you can set up your return and print off an optional prepaid return shipping label. If you are returning your item for a refund using our label, a flat fee of $15 will be deducted from your refund for order over $100. For order less than $100, a flat fee for $10 will deducted from your refund. NOTE: If you are outside the United States and wish to return your package, you will cover own shipping expense with your own choice of shipping company. There will be 15% restocking fee on all return orders for refund that are without materials/workmanship defects. If you are sending a package back using one of our prepaid return shipping labels, it can take 8-10 days to arrive to our warehouse. Once the return is delivered to Country Outfitter, it can take up to 7-10 business days for our returns department to process the return and issue the refund or store credit. We will contact you by email as soon as your return is processed. that you use our return process and return shipping label. This will allow lower shipping costs for you, faster processing, and full protection of your return delivery back to our warehouse. If you request a refund, a confirmation of the refund will be emailed to you. We issue refunds immediately, but it may take your financial institution 2-3 days to post the funds to your account. Please note that any shipping fees paid on your original order are nonrefundable. Each exchange will be charged shipping & handling charges. Each pair value over $100, shipping & handling charges will be $20 and each additional pair will be $10. Each pair value below $100, shipping & handling charges will be $10 and each additional pair will be $6. Shipping fees will not be charged if customer received incorrect items due to an error made by RidersMall.com. In this case, RidersMall.com will reimburse only standard ground shipping charges. If you believe the product you received could be defective, please contact our Customer Service department before returning the item. Once the item has been examined by our product experts, we will determine if we are able to make a replacement order or issue a refund. While we are unable to guarantee an outcome, we will do our best to reach a conclusion as quickly as possible. Returns are processed through your Ridersmall.com account. If you were a registered member when you place your order, you can log into your account here to set up your return. Select the order you would like to return with the Return Item(s) button. Choose whether you are returning for a refund or store credit. Select the item you wish to return and the reason for your return. Click the button to Create Label and Complete Return. You should see a success message and another button to print your return label. The label will also be emailed to you if you prefer to print it later. To complete the return, click “Request a Return.” This will create your return and generate the shipping label if one was requested. This label will be emailed to the address used to place your order. Please be sure to check your Spam folder. Attach the return label to the outside of the shipping box, not to the product or boot box. Mark through or tear off the original shipping label to avoid incorrect scanning during shipment. To ensure your return is processed in a timely manner, fill out the return and exchange form that was included with the order. If the return form is not available, you may print a new copy here. If you would like to track your return on the way back to us, you can click the return label tracking number under the RMA number in your order details. Once it arrives to our warehouse, it can take a few days for processing, but, as soon as it is complete, you will receive a confirmation email.